English, Thomas Moss (fl. 1786-d.1827), London, c. 1805. Ebonised wood, brass, gilt-brass, glass and silk. The case with brass-bound single pad and leaf cast handle to the arched top, the sides with silk-backed fish-scale pierced brass sound frets raised on brass bracket feet, the fully-opening front door with brass angle mouldings and with silk-backed brass fret-cut panels with foliate scrolls below brass bezel and convex glass, the white painted dial with Roman chapters and gilt-brass hands, with strike/silent lever above XII, the eight day movement with shallow-arched plates, twin line and fusees with anchor escapement and hour strike on bell, trip repeat (lever lacking), the backplate with engraved border and signed Thos Moss / LONDON / 165, with holdfast for pendulum with faceted rod and flowerhead-engraved bob; vertical brass bead moulding to the front corners of the case (right-hand moulding missing). Thomas Moss worked from 1786 until his death in 1827. His premises were in Ludgate Street, London, not far from Lincoln’s Inn Fields. 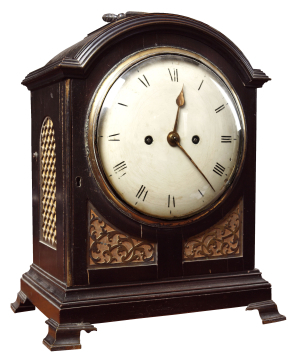 On 30 May 1809 Soane records in his Journal that he paid ‘Moss for clock for Chelsea £17:15:6’, which may be a reference to its purchase.1 If so this would indicate that at that date it was intended for Soane's small house iat Chelsea. It was certainly in his collection by January 1818, when Moss repaired it, and it may have been in the second floor front room at Lincoln's Inn Fields when it was Mrs Soane’s bedroom (from 1812 until her death in 1815).2 Along with the wash-stand in the south-east corner of the room it seems a slightly incongruous element in the furnishing of Soane’s Model Room. 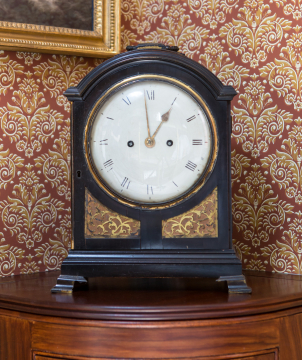 In 2015 this clock was reinstated in its original position in the recreated Model Room as part of Phase 2 of Opening up the Soane. 1 SM Archive, Journal 5, 30 May 1809. Soane was appointed Surveyor to the Royal Hospital at Chelsea in 1807 and as such had a house there. 2 SNB 19 January 1818 ‘Pd Moss for rep[ai]rs to clock &c. £0.18.0’.